Top-rated talk radio host Rush Limbaugh finds a “silver lining” in the downgrading of America’s credit rating: There no longer is any doubt that President Barack Obama can be roundly defeated in 2012. “Obamageddon — that’s what we have witnessed since Friday,” Rush told his listeners on Monday. “Obamageddon. Barackalypse Now. The only silver lining I can find is that as far as 2012 goes, Obama’s a Debt Man Walking. Anybody want to tell me he’s not landslidable now? He also charged that Democrats are trying to play the blame game against Republicans over the financial crisis. “Obama is always running around complaining and whining and moaning about all that he inherited from George W. Bush,” Rush said. “Well, he inherited a AAA credit rating, an unemployment rate of 5.7 percent. Editor’s Note: Some experts fear that 50% unemployment, a 90% stock market crash, and 100% inflation are on the horizon. Watch the Aftershock Survival Summit Now, See the Evidence. Limbaugh’s comments came the Monday after Standard & Poor’s downgraded the U.S. credit rating from AAA to AA-plus , and the Dow tanked 634 points. Obama blamed the downgrade on political gridlock in Washington and said he would offer some recommendations on how to reduce federal deficits. Obama stopped short of sharp criticism of Standard & Poor’s for its downgrade of U.S. debt to AA-plus from AAA on Friday. Senior administration officials have accused S&P of going ahead with the downgrade despite a $2 trillion mathematical error. “Markets will rise and fall, but this is the United States of America. No matter what some agency may say, we have always been and always will be a triple-A country,” Obama said. As Obama spoke, stock markets were registering another steep decline, dropping more than 450 points in afternoon trading. A joint bipartisan congressional committee, to be formed under the legislation passed last week that averted a government default, is to report its recommendations in late November on how to cut $1.5 trillion in spending over a decade. Obama said he would offer his own recommendations for fixing the problem and cited again the need to raise taxes on wealthier Americans and make modest adjustments to popular but expensive entitlement programs. Limbaugh took the president’s comments about the S&P, and threw them right back. “What are the Democrats doing? Blaming the referees! Blaming Standard & Poor’s! That always changes the outcome, doesn’t it? Blame the refs. “So go ahead and blame Standard & Poor’s all you want, Democrats. Now they’re blaming the military! Barney Frank and the Democrats are trying to say it’s the military’s fault that we’ve been downgraded. 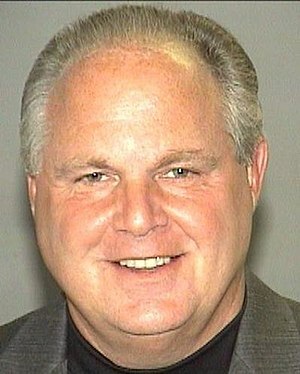 “This is the fault of the Democrat Party,” Limbaugh said, exasperated. Limbaugh went on to say: “So now we know what Obama got for his birthday: A downgrade of our credit rating, probably exactly what he wanted in his heart of hearts . . .
“World War II, we had a AAA credit rating, and we lose it now, and for what? For what great purpose did we lose it? Except an ideological hatred of American capitalism and a love of class warfare, what did we lose our AAA rating for? “Think about it: Obama’s finally managed another major accomplishment on that list he told us he had, that list that he said he’d only done about 70 percent so far. At long last, Obama and his fellow Democrats have finally been able to convince the world that we are just another country, after all. There’s nothing exceptional about us or our economy. But one person who does not buy into the theory that Obama is deliberately undermining the economy is Donald Trump. The billionaire developer said on Monday that the president is incompetent not malicious. Host Steve Malzberg asked him if he thinks that Obama takes a sip of champagne every time a trillion dollars goes out of the economy. The rich are getting richer. Their effective tax rate, in recent years, has been reduced to the lowest in modern history. Nurses, teachers and firemen actually pay a higher tax rate than some billionaires. It’s no wonder the American people are angry. Many corporations, including General Electric and Exxon-Mobil, have made billions in profits while using loopholes to avoid paying any federal income taxes. We lose $100 billion every year in federal revenue from companies and individuals who stash their wealth in tax havens off-shore like the Cayman Islands and Bermuda. The sum of all the revenue collected by the Treasury today totals just 14.8% of our gross domestic product, the lowest in about 50 years. In the midst of this, Republicans in Congress have been fanatically determined to protect the interests of the wealthy and large multinational corporations so that they do not contribute a single penny toward deficit reduction. If the Republicans have their way, the entire burden of deficit reduction will be placed on the elderly, the sick, children and working families. In the midst of a horrendous recession that is already causing severe pain for average Americans, this approach is morally grotesque. It’s also bad economic policy. President Obama and the Democrats have been extremely weak in opposing these right-wing extremist proposals. Although the United States now has the most unequal distribution of wealth and income of any major industrialized country, Democrats have not succeeded in getting any new revenue from those at the top of the economic ladder to reduce the deficit. Instead, they’ve handed the wealthy even more tax breaks. In December, the House and the Senate extended President George W. Bush’s tax cuts for the rich and lowered estate tax rates for the wealthiest Americans. In April, to avoid the Republican effort to shut down the government, they allowed $38.5 billion in cuts to vitally important programs for working-class and middle-class Americans. Now, with the U.S. facing the possibility of the first default in our nation’s history, the American people find themselves forced to choose between two congressional deficit-reduction plans. The plan by Senate Majority Leader Harry Reid, which calls for $2.4 trillion in cuts over a 10-year period, includes $900 billion in cuts in areas such as education, health care, nutrition, affordable housing, child care and many other programs desperately needed by working families and the most vulnerable. The Senate plan appropriately calls for meaningful cuts in military spending and ending the wars in Afghanistan and Iraq. But it does not ask the wealthiest people in this country and the largest corporations to make any sacrifice. The Reid plan is bad. The constantly shifting plan by House Speaker John Boehner is much worse. His $1.2 trillion plan calls for no cuts in the wars in Afghanistan and Iraq, and it requires a congressional committee to come up with another $1.8 trillion in cuts within six months of passage. Those cuts would mean drastic reductions in Social Security, Medicare and Medicaid. What’s more, Mr. Boehner’s plan would reopen the debate over the debt ceiling, which is now paralyzing Congress, just six months from now. While all of this is going on in Washington, the American people have consistently stated, in poll after poll, that they want wealthy individuals and large corporations to pay their fair share of taxes. They also want bedrock social programs like Social Security, Medicare and Medicaid to be protected. For example, a July 14-17 Washington Post/ABC News poll found that 72% of Americans believe that Americans earning more than $250,000 a year should pay more in taxes. In other words, Congress is now on a path to do exactly what the American people don’t want. Americans want shared sacrifice in deficit reduction. Congress is on track to give them the exact opposite: major cuts in the most important programs that the middle class needs and wants, and no sacrifice from the wealthy and the powerful. Is it any wonder, therefore, that the American people are so angry with what’s going on in Washington? I am too. Mr. Sanders, an independent senator from Vermont, is a member of the Senate Budget Committee and the longest serving independent in congressional history. Cross-posted at The Wall Street Journal.